Now that all of the ATF wranglings have died down, EP Armory is set to release a new Kevlar reinforced Polymer 80% Lower Receiver. Gone are the days of the differing color biscuit and raised pin hole placement indicators. 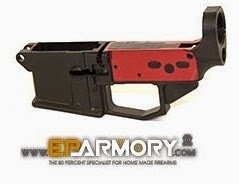 However, EP Armory does provide a sticker placement jig for properly locating where to machine out the remaining material to finish your lower receiver. Of course, you could always utilize online schematics to measure and determine exactly where you need to remove material for accurate results.